ANOTHER LAWSUIT for 1.5 MILLION in Civil Right Damages, for a child's family where the child was placed in direct harm's way, by a CPS EMPLOYEE @ DHS. Such lawsuit was recently accounced in 2018. Great to see another innocent victim(s)win against such abhorrent agency workers, who can care less about one's right. Suing CPS employees are growing in the 21st century. SITTING ONLINE doing nothing for which is productive/holding cps not accountable was also no option for our amazing founder/boss a true-fighter for JUSTICE Ms.Melendez. .She knew exactly what the proper course of action was, without a lawyer pro-se and she has filed her suit timely by deadline and then applied at multiple laws schools, for which she now is focus on law school to one day procure her juris doctor. while pro-se. Read more below, prior to calling in, everyone. (for those instituting such timely civil rights damages lawsuit, without a lawyer known as PRO-SE, in a timely manner against DCF,DCFS,DFPS,DYFS,DCPP,ACS,CYS,CPS employee who has clearly violated your right. Implement our busy e-staff HELP/CONTACT US form found directly below. Thank you. Good luck to all." do NOT care enough about your rights to sue then be sure to timely file(key word is "timely,"
BY DEADLINE, execute your suit pro-se self file within the time allotted by law to hold cps employee accountable when harm has darken your life and your children and or grandchildren. 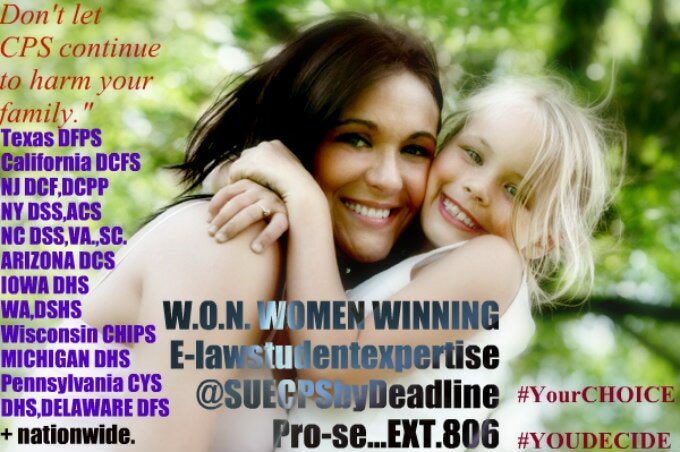 Such lawsuits are now continually being filed,and we here, at the nation's only verified 1 of a kind consult pro-se self file empowerment educational 1-on-1 lawsuit pro-se advocacy women's #winning network W.O.N., we are lauding those who are as our boss/founder is astute prudent enough to file such lawsuit in a timely manner, when a lawyer do not care enough about you nor your rights to file... Now...Fill out below help form. You're to check your inbox 15 min. to 1 hr.later today to call in, as confirmation is sent via electronic email. Good luck suing #CHILDPROTECTIONSERVICES and or per caseworker, former lawyer(legal malpractice) therapist et.al., DCFS for the violation of your rights and the rights of your family. 1-929-277-7848. Looking for e-help form to fill out for your same-day POWER session 1-on 1 to sue cps pro-se by deadline? Scroll down below, and good luck suing by deadline, (when lawyer do not CARE about YOU at all to represent you timely.) Our astute unique 1-of-a-kind take ACTION e-staff wish you all the best of luck timely filing without a lawyer pro-se self file vile CPS. AND in some extreme cases as our founder ms.melendez, to keep a child (without a court order/and or warrant) out of her own home,with her sister,for shockingly almost, just about TWO weeks, absent imminency; (imminent danger/exigent circumstances.") Such caseworker,as clearly-established has to procure a court order, judicial authorization/and or a warrant to remove the children,from returning to their loving home. 4th amendment lawsuits against cps with AND without lawyers are growing premise on such relevance.Click for more." 1-929-277-7848 (help form directly below)everyone. ​The mere possibility of danger does not constitute an emergency or exigent circumstance that would justify a forced warrant-less entry and a warrant-less seizure of a child from the custodial parent." 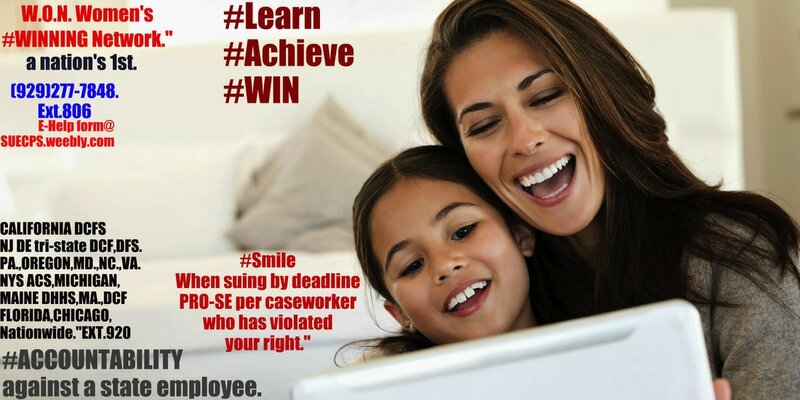 SMILE...while you're on your way now to implement(correctly/timely) your civil rights lawsuit against abhorrent DCFS,DSS." Lawsuits are being won continually throughout(as seen below) NYC,CALIFORNIA,NJ,DE.,PA.,CHICAGO,OREGON,WA.,NC., nationwide ... It all hence,begins with one person and that person is YOU, or sit "online"and remain in the same exact spot you are used of being at,this point in your life.#YOURCHOICE YOU DECIDE ext.806. Facebook(Click LIKE for all update(s) and be sure to add us on Twitter et.al., and be sure when calling in,ask for ext. 806/920. MORE LAWSUIT $$$ ALL WON BELOW. GOOD LUCK SUING BY DEADLINE DCF employee violating your rights, in a timely fashion everyone." $800,000 in damages (through a settlement) MAKING NEWS HEADLINES. 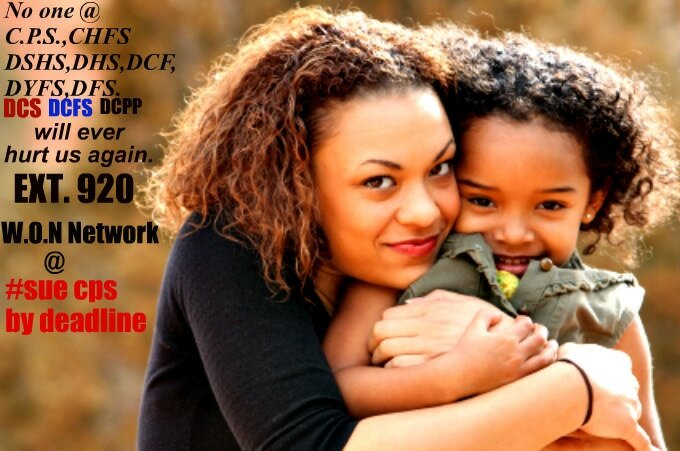 Parent was violated by DCFS & County,in CALIFORNIA . ​DELAWARE DFS violated a loving mother, who turned around and rightfully exercise her right to sue for civil right money damages. Mom won an un-disclosed amount for damages. This settlement was not made available at the time, to the public,so be sure to cite this lawsuit win when you're having your 1-on-1 POWER session with owner/founder ext.806 our e-staff. $2.5 MILLION in damages for a teenager(boy) who is now, of age the records show our law student research consulting network, where he was for some time, placed at risk by DCPP,DCF,DYFS,et.al., emotionally abused & fondled(sexual abuse) and a child who was routinely put at risk,while state agency knew and or should have known as the newspaper and the case records support. hence good luck to all suing pro-se self file, CPS.